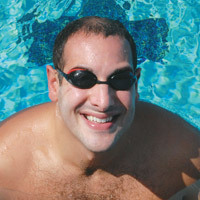 Pediatrician Michael Ginsberg, M.D., of the NorthBay Center for Primary Care in Fairfield, has been swimming since age 7. Today, he says that’s what keeps him fit and centered. Growing up in Michigan, everyone in his family was required to choose a sport. A self-proclaimed clod on land, he was one of the fastest kids in the water. In high school he spent four to five hours a day in the pool and his swim team was state champion. It was then that a friend introduced him to the Master Swimmers program and he got back in the water. Master Swimming began in 1970 as a way to give swimmers age 18 and older a goal for keeping physically fit. Today the nationwide program has more than 42,000 adult swimmers. Each chapter has a coach who assigns the daily workouts. “I knew that being an overweight physician wouldn’t set much of an example for my patients,” he says. “I liked the Master Swimmers program and I managed to keep up with it all through medical school and residency.” The result—he lost the extra 50 pounds. Today Dr. Ginsberg is in the top 10 percent of swimmers in his age group and swims with the Vacaville chapter of Master Swimmers. “Losing weight takes an hour of vigorous exercise five days a week,” he says. “It’s a slow, arduous process, but it’s how someone who’s obese can bring them-selves down to a normal weight. It is a good whole body workout. You use almost all the major muscle groups. It places a vigorous demand on your heart and lungs. It develops muscle strength and endurance. It is a useful exercise for people with leg or lower back problems. Offers the same aerobic benefits as running. Swimming places no stress on bones, joints or connective tissue. It improves your body’s use of oxygen. Swimming benefits people of all ages.